I've got a new idea for you. The other day I was exploring a few VRML (Virtual Reality Modelling Language) pages on the Web. I downloaded a couple different browser plug-ins. They're all pretty hard to use. I think we should look into developing either a full VRML browser or at least a plug-in. The popular conception of the future of computing is of a 3D environment, and developers continue to push into this area. But usually you need special hardware--a 3D mouse, VR goggles, power gloves, etc. Yet I don't think people buy this hardware because the payoff is too small--there just isn't enough 3D software out there to make it worth the expense. And yet how can developers really explore innovative 3D solutions if no one is outfitted to use them? Obviously if we're going to produce a more usable product than what already exists, we'll have to do a lot careful HCI design and usability testing along the way. I'm thinking of following Rosson and Carroll's scenario-based design, with a slight lean towards essential use cases rather than just scenarios. I believe Sally's finishing up the Reynold's project next week. If so, even though Arete Production is still a small company, I think we'll have enough man-hours to undertake this in a relatively timely manner. I hope you're interested. Later this week, I'll send you a more formal development plan. I have the root concept and design plan up. (I'm straying further away from SBD toward usage-centered design.) I've reviewed a number of browsers and am starting to select a couple to run artifact analysis/usability tests with. Also, I've sketched out an interview guide. For next time, I still need to check out a couple browsers in more detail, especially Cosmo and WorldProbe. And I need to find some subjects for the browser run and interview. I've already started on some thinking about the tasks needed for a 3D browser. It's been a while! Sorry about that. Hope you had a good holiday, and all the best in the New Year! I've moved on to the analysis and synthesis stage of things. Instead of doing a browser run now, I'm pushing it back to a comparative usability test of our new browser verses one of the popular big boys. Instead of looking in more detail at the couple 3d browsers, I looked a little wider and reviewed a few immersive gaming environments. A review of Tomb Raider made the browser list; their control changes based on context and their user-defined controls are interesting prospects. The problem themes are still a little sparse, but the usability test might give us a bit more there. (This whole process theoretically allows such iteration, though I have my doubts about that.) I've made a bit of progress on the technical details of the prototype implementation, and it looks like that will be a "go", though it'll be a few more days before we know just what to try implementing. The main product of this session was a load of activity claims, which are straying into the area of interaction claims. I've found the brainstorming quite helpful. Social contexts and user roles are more prevalent than I first imagined, but still probably won't be a big part in the first version of the browser. I threw in an activity scenario too, in case we need to share the sort of issues we're considering with the uninitiated. The future step is working through those tradeoffs and picking an implementation--the task we want, the controls that support them, and in which contexts--that sounds like it will work. I'll probably double check things by doing an abstract context or two for the essential tasks. Is there a word for that action of scooping all the playing cards together after a game and jostling them all together into a single neat pile before you can start shuffling? The most interesting realization is that I can't remember any VRML browser I've seen ever having clickable navigation buttons that control motion or orientation. All allow keyboard control, most allow control by dragging the mouse across the screen, and most have buttons toggling the navigation mode (which effects both mouse drags and the arrow keys). But I can't recall any having screen buttons that actually control motion. It's a "deficiency" I'm keen on exploiting. The downside is that I'm not sure if the Cortona XML skin plan for the prototype will still hold up, since mostly the skin maps buttons to modes. We'll see. At this point, I am realizing that I don't know much about VRML itself. It's hard to design a usable browser if its controls are of a different paradigm than the underlying protocol for motion. This personal "limitation" was recognized at the outset in the Root Concept, so I knew it was coming. The flipside has been designing with a "beginner's mind." But as we move into Design and Prototyping, it's making me a little nervous. What's intereresting is how many browsers have adopted these modes in their interfaces. Actually, it seems these only deal with how the browser handles collision, terrain, and gravity. So they can largely be dealt with behind the scenes (though we may need to grey-out certain options, such as "up" when gravity should not be overcome. It seems the control scheme(s) I've designed remains unaffected. Anyway, at this point I now I have two prototypes. I want to run some basic usability tests on them and clarify them in the next (and final) stage. To create a novice user interface to a 3D browser using commonly available input devices such as a keyboard and a mouse. The online 3D world could use a stepping stone for novice users. These users are very unlikely to have a 3D mouse or stereoscopic goggles. Also, they may not be used to the controls used by experts. A simple, versatile browser would be of great help to these users. That 3D worlds are novel, exciting, or useful enough to warrant attention. This is the current design plan. It is subject to change. The table of contents will probably be the best indicator of the final path taken. This includes the Root Concept and other meta-considerations that will guide the design process. First off, there is a number of existing 3D browsers. These should be examined for good and bad design ideas. Since I am a 3D browser novice myself, I should have a good sense of what works for the layman. However, to ensure this, some sort of short interview and comparison of existing designs by a handful of novice users would give some usability info before I get started. Findings from this stage should be consolidated into problem "themes." In the spirit of activity design, an analysis of the basic tasks and actions needed to navigate a digital 3D space should be considered, outside of any existing interface. This will provide us with some essential use cases. Also, I'll start considering tradeoffs of problem themes with some activity claims. Though I'm not planning on including chat and other social features, there are still certain contexts/modes and user roles that will influence the tasks. This step may also include an activity scenario or two. Armed with a firm sense of the tasks that need to be supported and some ideas of the tradeoffs involved for each, I'll work on the how the system will support them. This will involve both the interaction/controls and information/display aspects. I will probably sum this up in an abstract prototype, though some scenarios might be helpful too. Now to instantiate the design. I'd also like to briefly test it to see if people prefer the design over existing browsers. Most of the browsers below are from Web3D Consortium's list of browsers. Actify. Mostly deals with CAD. Handles some VRML. Free plug-in. Only handles object manipulation, not movement of the view through a world. In one mode, the user can grab and move object around in place with the mouse. In pan mode, the user can drag the object up, down, left, or right on the screen. Also has zoom controls. blaxxun Contact. These people have been severely influenced by Neal Stephenson's virtual cyberpunk world, Metaverse, from Snow Crash. They even have the Black Sun club in their online world Cybertown. And so their browser supports avatars, gestures, chat, etc. Can move with the mouse or keyboard. I find keyboard easier (due to excessive old-school computer gaming?) . With mouse, click and drag in a direction to move/turn that way. Either way, there are four cardinal 2D directions to choose from. Fly. Like walk, but gravity does not pull you down. Pan. Like examine, but works as expected. Limited to normal head motion--tilt stops at not quite straight up and not quite straight down. Turning to the side is unlimited. Jump. Click on a space/object and avatar will smoothly slide there. Mouse turns to hand and can click on objects. Possible it include avatar in view (3rd person vs. 1st person). Supports viewpoints--designer selected locations of note in a world. Holding down Control allows for panning up and down and sliding left and right. (In Walk mode?) Shift increases speed. Has an interesting feature that movement is slow for first second, then faster after that, which allows for fine/delicate movement when needed. Version 5.1 doesn't support VRML1.0. Need 4.4 for that. Parallel Graphic's Cortona. Of these browsers, this is the most frequently downloaded from CNet's Downloads.com. Keyboard or mouse (again, only 4 directions/buttons at a time.) 3 Modes: walk, fly, study. 4 options for each mode: plan, pan, turn, roll. (I had to learn this from the manual--all 7 buttons are along left side; though spaced and labelled, that doesn't help much in determining how they work combined.) (Interesting that these are so similar to blaxxun's Contact. Do they know something I don't?). This means there are 12 possible combination. I'd like to sound knowledgeable here and tell you how it all logically works, but I didn't spend the time to figure it out. I just skimmed the page. Besides these 12 "states", pressing space, alt, control, or shift during these changes speed and possibly functionality. Study is used to let you move the world/object, rather than yourself. This can be confusing because you can roll around the center of some object, which is often the center of the world. When the world is moving, it's not clear that you're not moving yourself, except for certain slight weirdnesses. Other buttons: restore (to original entry state), align (get back to vertical after you've messed yourself up), goto (like blaxxen's jump), and cycling for viewpoints. Can create XML skins that not only change the look, but also the functionality of controls! I think I can actually put new/more/different control buttons on the screen. Look further into this for prototyping (as an alternative to Java3D) Also a number of extensions available. Tomb Raider. Not a browser, but a computer game. Much could be learned from first-person games, since the basic motion dynamics are the same. However, games are getting increasingly more complex to control (as can be seen by the evolution of game system controllers). So though they may be a source of innovative solutions, they may not be the most usable designs for novice users. There are some interesting context changes in the game, where the same keys produce different motions. When climbing a vertical surface, the left and right arrows now slide the character left and right; up and down now move up and down, rather than forward and back. Yet the change is hardly noticeable because a vertical rock face only affords certain motions. When swimming underwater, up and down now rotate up and down (to swim deeper or to swim up to the surface). Left and right still turn-left and turn-right. Forward motion is now controlled by the jump key; this makes some sense because Lara Croft has a pretty killer frog-kick/breaststroke. There is no backwards motion underwater. Another interesting aspect is, with so many keys, it is possible to define your own key bindings. The game has two sets of key bindings: Default and User. Both come preset. Default is not editable; it uses the arrow keys, Alt, Ctl, Shift, Enter, etc. The User keys are set to use primarily the number keypad, though they can be changed to use any key. If the same action is bound to a different key in both the Default and User setting, User settings take precedence. These browsers I didn't actually use, but examined their manuals or other documentation to learn how they deal with navigation. Cosmo Player. Their caveat: Some VRML worlds are more movement oriented, others force object manipulation. Some have a default but allow the other form of motion. 2 major modes with three minor modes for each. Control or Alt switches modes within either Moment or Examine. Other controls: undo/redo last move, activate objects, (controlling movement can be tricky in a busy, activating world; use seek to go to an object without activating it), viewpoints (next, previous, list). Adobe's Atmosphere. This is not actually a VRML browser, but one for Adobe's proprietary 3D format (typical). They have set up a test world based on the movie Dark City. The following is according to the PDF user manual. With mouse or keyboard, default movement is: up, down, turn left, turn right. Holding shift allows you to move: up or down, slide left and slide right. Holding control means you pan: turn up, down, left, or right. Other buttons include: restart (back to your "home" world), back (return to the starting point of the current world), make gate (basically bookmark current position), and screen shot. The browser also supports chat and avatars. Setable options: gravity (on/off), collision (on/off), acceleration, and max velocity. Acceleration only works with arrow keys. UpperCut's WorldProbe. Not much information here. Their navigation controls screen shot implies 4 modes--walking, flying, viewing, and object handling, as well as a zoom and jump. No FAQs yet. This might be one to download and investigate further. OpenWorld. 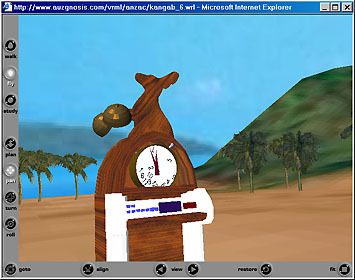 An X3D browser. Available for integration into other applications. There does exist a stand-alone OpenWorld Horizons browser. Need to agree to a long license and sign up to download, so I didn't. Eyematic's Shout3D. Not very informative web page. System requirements: 200MB disk space, 512MB memory, 700Mhz processor. More than I can deliver! Do you have any experience with online virtual reality or 3D worlds? Are you interested in 3D worlds? --discuss alterative setups, modeless controls, etc. These are intended only to be a consolidation of important trends or points of the current state of affairs as discovered during data gathering. Their tradeoffs (if applicable) will be analyzed later. Sometimes, as with small objects, you want to move the object. In immersive worlds, you usually want to move yourself. Moving a scene, when you think you're moving yourself, is subtly confusing. In every browser viewed so far, there are modes. The same controls are used, but produce different results. Arrow keys allow for only 4 inputs. Strangely (? ), the mouse does too. Though more may be possible, the four directions of a 2-dimensional plane are what's expected. The mouse does allow for speed control, however, depending on the distance the cursor is dragged. As Stephenson pointed out, it's important to support realism. Probably why there is a difference between flying and walking modes. Most browsers include a jump. And a reset. Worlds often include designer-designated viewpoints. In some worlds, movement is not permitted--only panning or viewing from these points. In most browsers, moving is like walking with a stiff neck brace. Unlike the real world, you can not turn your head and view something to the side as you continue forward. I'm not sure whether this technically classifies as Essential Use Cases or Hierarchical Task Analysis, but I know what I want to do: look at the basic elements of motion in 3D space. Any point in the coordinate volume can be reached with a combination of these motions. It should be noted, however, that when you add rotations, the 3 directions of motion are no longer essential. The fewest, barest-bones controls that would get you anywhere (and see anything from there) are only: forward, turn up (or down), turn right (or left). Anything beyond these just makes things easier. We know, from the Root Concept, that we will be using keyboard and/or mouse to control motion. Much of this discussion is too concrete to rightly deserve the title Activity Claims. Yet there is a smooth slide between Activity and Interaction Claims, so we'll keep things together here, though most specific key binding discussions are indented a bit. +Sometimes, if the object is small, interaction makes more sense this way. -Possible to move around an object and achieve the same views. -Currently in VRML (as far as I know) a user cannot move distinct objects within a world (the world is the object). Other controls (in any format): jump, realign, cycle viewpoints, object mode, restore. -Requires separate user controls (with sufficient feedback that users know they're simply changing the view, and not their avatar's orientation). -Mouse can control speed by drag speed; also include different mouse buttons to control context. -Mouse is probably the first method users will try to interact with they system. can be stick forward/back (which corresponds to nose down/up), bank left/right for a flight simulator where a single key can be bound to nearly any motion, given the right context. +Most existing browsers support it, implying it's a "natural" choice (at least among the software designer populations). -Not very often used by novice computer users, who may hesitant to experiment with the strange, power-user buttons. The following are some of the more promising possible key combos. Normal means arrow keys without additional context; Alt, Ctrl, and Shift are the actions of arrow keys when those keys are also pressed. +A variation on the "barest controls" necessary, as discovered in ETA; no other keys or contexts would be needed. +Does support the most commonly used keys: forward, turn-left, turn-right. -Theoretically interesting, but probably frustrating in practice. Over-rotating would require a 360 degree turn to get back again. Turning a 2d view of a 3d world is already rather disorienting. In short, novel and possible, but slow and irritating (like so many miniaturization efforts). +Most commonly used by reviewed browsers (with some small variation, such as whether roll-left/roll-right is instead turn-left/turn-right, or which state is invoked with Ctrl or Shift). Even if this is not the wisest choice for all users, it would meet expectations of 3d browser users. +The Alt key, as an alternative to motion, deals more with changing orientation or view. -Roll is probably not used that often, so a user trying "look" around would need to alternate between Normal and Alt key sets. (Roll could be dropped for a repeat of turn-left/turn-right). -Though there might be slight mnemonics to the key sets, they still need to be learned. -Alone, like all key bindings, they lack much affordance or learning aids. Minimalist: have a different key, such as spacebar, move forward; arrow keys all look. Browser Default: basically any combination of the 12 basic actions discovered in ETA, broken into 3 sets of 4. Browser Default: add more contexts. Ctrl+Alt would make a good flight sim mode: automatically move forward, with yaw up/down and roll left/right. (As far as I know, no browser has implemented a flight mode such as this; "fly" usually just means gravity can be overcome and the avatar can be moved vertically. +A number of other possible key bindings in close proximity (1,3,7,9,0, +, -, *, ., etc). -Number pad configurations are not universal. -Keypads require a certain amount of coordination not inherent to most users. The following is one promising, example number pad key binding set. -Not "intuitive": people are used to moving the view with arrow keys, not with letters or numbers. -No aids to learn the key combos. As shown by this real-world example, this can be clumsy and unintuitive. It would be workable really only if the user picked the keys herself. -Users have to understand the system and the action keys correspond to before they can reassign them. 12 buttons arranged into 2 3D axes--basically as shown above in ETA--where one set of axes controls the 6 possible rotations while the other controls the 6 possible motion directions. +A simple toggle switch between motion and object-manipulation modes would be possible, since the controls would apply equally well to both modes. -Can we graphically depict 3d controls clearly enough to be recognized and understood? -Normal navigation must switch between the two: forward, and turn-left/turn-right are on two different axis. -If screen controls are supposed to serve as a guide it keys, then it means controls should be organized similar to key bindings. +Once you've gone to fullscreen, there's no control to get back unless you've remembered the key combo.Dangerous to offer users such one way trips where the return trip is through a different route. +The menu button (or right-click menu) is likely to be the only button/feature available in Fullscreen mode. The toggle to turn it off should be there too. +Harder to find as a feature (for the unwary). -Many other mode buttons are on the screen; why break the continuity? In general, browsing a 3D world is not a social activity. Navigation is not usually collaborative, though your friend might be watching over your shoulder telling you where to go. Many worlds now support chat as well, which is certainly a social activity. Like websites, some worlds are primarily places for interaction with other users, while other worlds are simply meant to be explored. There doesn't seem to be a big difference in user roles either. Of course, there will novice or casual users who need a working, easy browser quickly for occasional uses. Expert or power user may desire more customization, such as updating key bindings. World authors may also want additional features, such as being able to walk through walls which normally cannot be walked through. Other user groups may be minors whose parents would like to restrict access to adult-oriented worlds. Different users speak different languages, which may also be a concern. Besides language differences, keyboards are often different around the world, especially with respect to letters available and their location on the keyboard. This could be important for some default key-bindings. This is an activity scenario intended to convey what this sort of software should allow, independent of actual controls. Bob has just entered a fantasy world. In the distance through the palm trees he sees a strange shape. It looks like a statue of a rabbit. He moves forward in that direction, skirting around a palm tree on the way. When he gets to the foot of the statue, he can no longer see the top of the statue in his field of vision. He looks up. Hmm, maybe it's a different animal, like a kangaroo. Looks like he's standing on a broken clock or a jukebox. But what's that he's holding? A ball? Bob wonders if he can zoom in his vision, like some sort of bionic man, but he doesn't know how. Instead, he decides he'll fly up closer to the "ball" and see what it is. He does so, and discovers that the kangaroo is actually holding two.. acorns? No, maybe they are alarm clock bells. "Curiouser and curiouser," says Bob. Shown here are the two interaction contexts (content models). Navigation between the two contexts is achieved through Motion/Object toggle control. The actions listed here are those that need to be supported through some means. For a discussion of how and why, see the next section. Our primary concern, from the beginning, has been determining the nature of the controls. The view of the world already provides much of the feedback about the current state of the application. (If there are navigation modes or other control states, they will require additional feedback.) Now that we've delimited the main possibilities in Activity Claims, we can compare many of the tradeoffs. I think we need screen controls. Some people are primarily mouse-oriented. Also, it allows for control feedback not possible through the keyboard. It conveys the types of motion or rotation possible. The disadvantages can be outweighed by also including keyboard controls and by a fullscreen mode in which the screen controls are removed (for those who greatly prefer screen real estate over visible controls). There are two major possibilities for the correspondence of keyboard controls to screen controls. Either there can be mapping or the two can be independent of each other. If the two control sets are mapped, the screen controls should be grouped so as to demonstrate how they map to the keyboard. For example, if the 3d Default Browser keys are being used, the screen controls could consist of three sets of 4 arrows, each laballed with the corresponding context button. The 12 arrows would be clickable. Admittedly, this idea does not work as well for other key bindings. I would not recommend placing screen controls in the shape of a number keypad or in the letter groups demonstrated under Single key-to-action Mappings. Also, these controls do not map cleanly to Object manipulation. Independent controls means there is no correspondence between the screen and the keyboard. This would allow for the 2x3 screen control design that maps directly and simply to the 12 basic tasks. This seems the clearest screen control set, but not the easiest to use, especially in the long run, since normal walking motion requires switching between the two. The keyboard controls could be any of explored possibilites. A compromise: implement the 2x3 design, but then label each of the 12 controls with the key that handles that control: "Ctrl + ->", "E", or "9". Ideally, these labels would change to reflect any user updates. This would allow the clarity of the 2x3 controls, but still allow for a (sort of) mapping to easier-to-use arrow controls. The drawback here in that the controls appear quite cluttered. This could be minimized somewhat by a better graphic artist. (I could use some help with the axes too!). Or things could be simplified further by putting the key bindings into tool-tips that pop up when the mouse hovers over the buttons. An object mode exists in practically every reviewed browser, which implies it is more vital than I suspect. (I think some VRML worlds can specify that only Object controls be used.) The major disadvantage to including it is that it is confusing to new users. Changing the screen control labels, or the color, or some other rather noticable change between modes would eliminate this. It should be implemented. On the same lines, the "extra" controls of realign, jump, cycle viewpoints, etc should be included for their convenience. On "view independent of motion or orientation", since these would necessarily use separate controls than those that control orientation and motion, they could be added later. At this point, they add complication to the basic to task of moving in a world. Considering our current target group of novice or casual users, we should shelve this option for now. Social contexts and user roles were more prevalent than first suspected. Chat would be particularly helpful. However, this too could be added later with little change. An always-on-top chat screen would be best kept separate from the screen control section, so it could be used in fullscreen mode and moved or resized as the user prefers. This could be opened by a button or a key combo or by clicking on another avatar. But for now, this should not be a supported feature. Settings, such as for VRML's on/off navigation toggles for gravity, collisions, and terrain-following, or for lighting effects, such as headlight, or for avatar aspects. Wizard/screen to redefine the keyboard key binding. Other, yet-unrealized, mostly-necessary but infrequently-used odds and ends. These should be in a menu, since they are not used often enought to deserve their own controls. Additionally, we should support mouse drags. By that, I mean the user can click the center of the world view and drag the mouse towards the edge. The distance from center determines the speed. The edge determines the directions: dragging towards the top of the screen is like pressing the "up" arrow, dragging to the right side is like pressing "right", etc. Here are mockup prototypes of the two proposed designs. Though I started out favoring a scenario-based approach, I seem to have switched to a very structured, traditional paradigm. The structure and logical progression just appeal to me, even though I know design is supposed to be more iterative than deductive. Here are a few thoughts on the techniques used in this project. I thought the browser review was a great tool. Though it isn't really mentioned in any of the literature, reviewing other similar solutions allows a designer to note design pitfalls, to try different prototypes before even starting to design, to find out what already works and how well, and what is lacking everywhere else. Problem claims are a nice way to sum up problems I would like to deal with later, requirements for the future system, etc. There were not developed very extensively here. I don't think iteration happens much in actual structural design. In that case, I should have done interviewing early on, as originally planned, in order to get more data at this stage of the design. Essential Task Analysis--an odd hybrid of HTA and EUC--worked very well. It was probably the single most useful tool in this project, though the write up is short. It gave the essential tasks that need to be implemented. This wouldn't be as helpful for all projects, of course. I love activity claims. These are a great brainstorming technique. I can work on just record ideas, with tradeoffs for each one. Then later I can switch modes to figure out how to best combine them in a design. I find the more brainstorming, the better. With a lot of options laid out, activity claims become almost a rational, deductive method of fitting the pieces together. The contexts and user roles were important to think about, though I neglected to implement anything from them in this project. I think scenarios are good for quickly summing up a bit of a design for a layperson, but for actual design purposes I prefer charts and lists of claims to clealy delineate all the factors involved. I like abstract prototypes because it produces an interface skeleton directly from the essential tasks. There's a certain automatic, logical progression to it. During the rest of the Design section, I don't think I followed any real method, but this was still a very important section. With all the data and tradeoffs, it was important to pull things together and actually make some documented choices between options. Towards the end, lots of little "forgotten" features started appearing--where to put the help button, how to organize the menu, how to change Options, etc. It was very hard to go back and iterate over the whole design to include these. The temptation was just to stick them in wherever at the stage they appear (usually prototype or implementation!). I'm glad I considered the future needs--chat, fullscreen mode, independent view control, etc.--and how they could be added the current system. Yet I still shelved these features in favor of producing a lean, simple product that focuses on the main uses of a 3d browser. Overall, I think my biggest fault as a designer is my general aversion to iterating over a design. A close second is an inability to stay on a schedule.